Singapore is a little island city-state on the bottom tip of the Malay peninsula in Southeast Asia. Due to its strategic location, it has had numerous cultural influences, not only leading it to become one of the most powerful and important sea ports in the world, but also the melting pot of cultures has made it a diverse international city, abounding with delicious food. My wife and I decided to spend almost two full weeks in Singapore, exploring the city, enjoying the lush gardens, but mostly just eating our way around the island. When you’re in Singapore, get yourself ready to eat lots of Chinese, Indian, and Malay food. 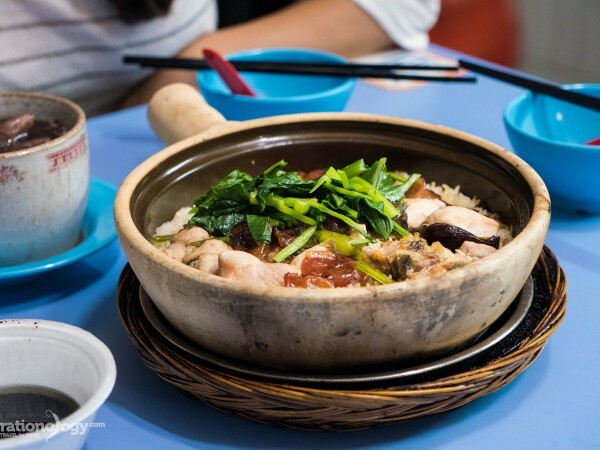 Food is one of the biggest pillars of Singaporean culture, and one of the most awesome things about visiting, is that you’ll be surrounded by an entire city of other food lovers! One of the toughest things about traveling is figuring out where to stay. And when you’re in Singapore, just like other major cities in the world, there are many different areas or the city that you can stay in. Overall, in my opinion, probably the best areas of the city to stay in when you’re visiting are the Chinatown or Little India area, or Downtown / Outram or finally Orchard or Bugis. But no matter where you stay in Singapore, the public transportation system is very good, so you can pretty easily and quickly get to any part of the city. Carlton City Hotel (About $200 USD per night for a double room) – During a previous business trip to Singapore, my wife and I stayed at the modern and luxurious Carlton City Hotel. It’s a very nice high end hotel located a great central location of downtown, about a 10 minute walk from Chinatown. This hotel would be great as a business hotel, or if you’re looking for somewhere to have a modern luxury holiday. 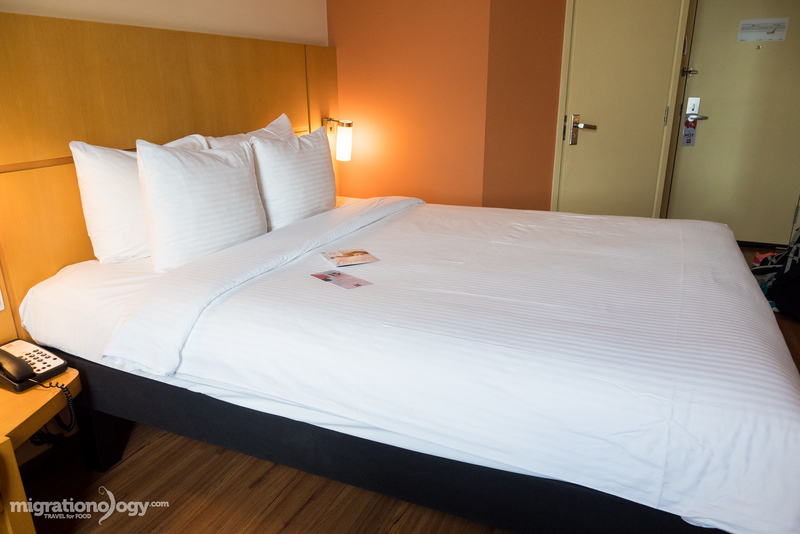 Ibis Singapore Bencoolen (About $85 USD per night for a standard double room) – Accommodation in Singapore can be really expensive, but my wife and I got a pretty good deal at Ibis Bencoolen. It’s a mid-range hotel, the rooms are on the small side, but they are modern and have everything we needed. Also, this hotel is located near Bugis, which is a great shopping district and good central location. *Affiliate links – If you choose to make a booking using a link above, at NO expense to you, I will earn a small commission. Thank you for your support. You can also see all my camera gear here, and my complete travel packing list. There’s an insane amount of delicious food to eat in Singapore, and I think food is one of the best reasons to visit the city. Singapore is such an incredibly diverse country (and city) with so many ethnicities and countries represented, each with their own distinct flavors and restaurants. 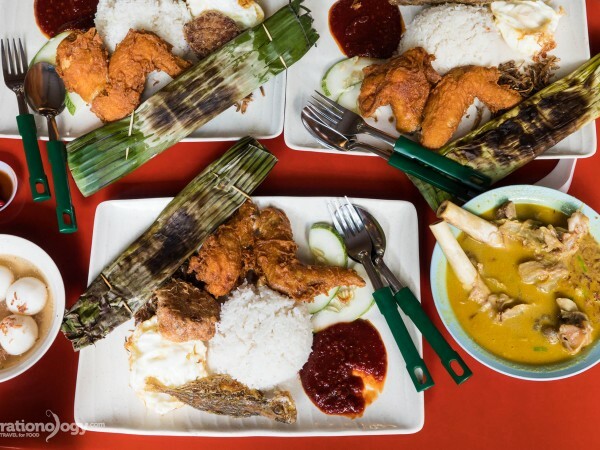 The most well represented food groups in Singapore are Chinese, Indian, and local Malay, but there are also some incredibly good restaurants that serve Western food and food from around the globe. It’s truly an international food city. What I’ve noticed about the food in Singapore, similar to Malaysia, is that the ethnic populations in the city are so big and so well represented that there’s a lot of food, such as Chinese or Indian, that has remained very authentic. But at the same time there are some dishes and some variations of ethnic dishes that have been transformed into unique Singaporean dishes. 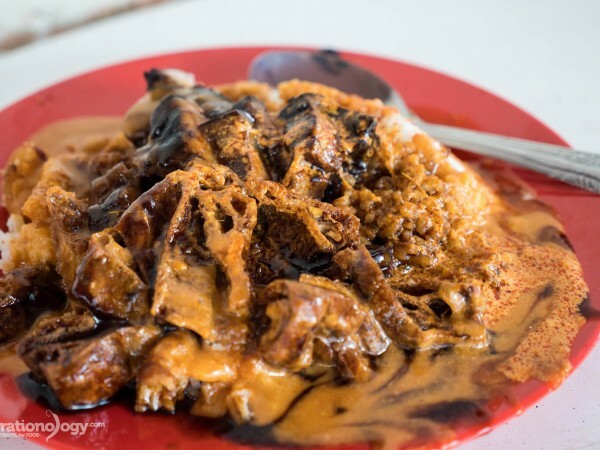 If you love food, you’ll definitely want to check out the full Singapore food guide, but I here I just wanted to share some of my personal favorite Singaporean dishes. 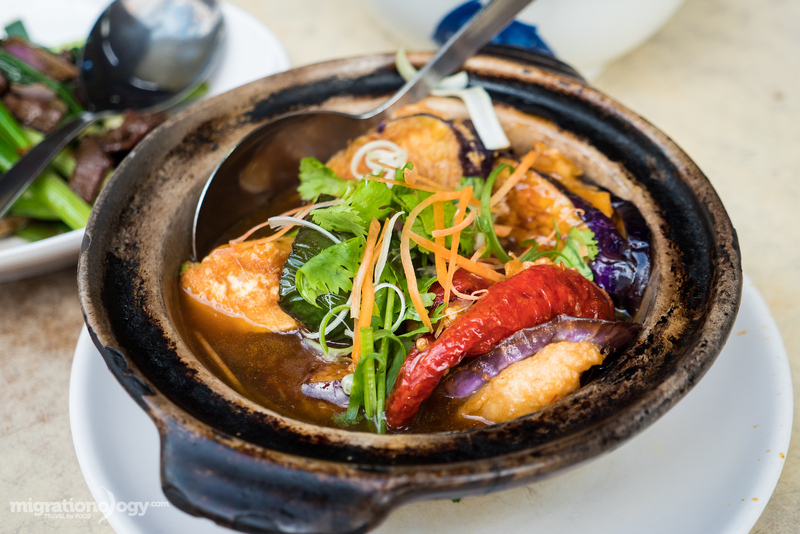 Fish head curry – This is the dish I would like to eat as soon as I arrive in Singapore, and that’s exactly what I did when I arrived. 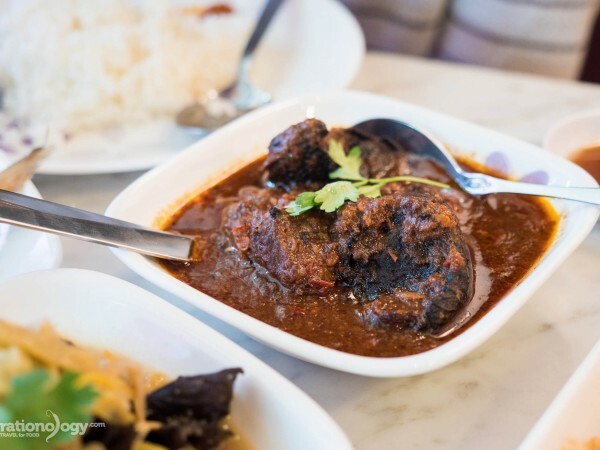 There are a number of different types of Singapore fish head curry, but I really love the Indian version – a giant snapper head swimming in an abundantly flavorful spice filled curry. You typically get a big bowl of fish head curry, and then eat it with rice and a variety of other curries off of a banana leaf plate. BBQ sambal stingray – Another one of my ultimate food favorite foods in Singapore is stingray, which is claimed to be a unique Singapore dish. The fillets of stingray are typically seasoned with a nice thick layer of sambal chili sauce (which often includes chilies, garlic, tamarind, and other ingredients), and then it’s grilled in a banana leaf package. The banana leaves ensure the stingray is both steamed and grilled at the same time, so it remains juicy, yet still with a light grilled banana leaf aroma. 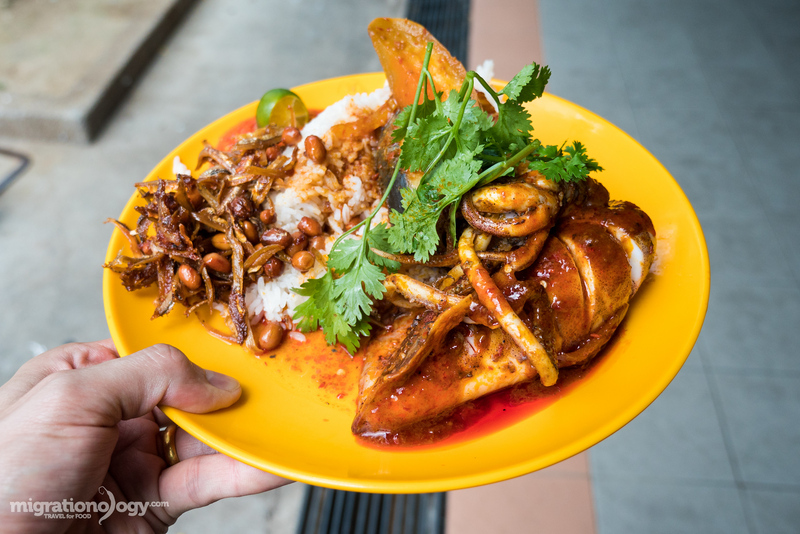 Don’t miss sambal stingray in Singapore. Nasi Padang or Nasi Malayu – Although originally from Padang on the island of Sumatra, Indonesia, being so close to Singapore, Padang food is also very popular. And due to the incredible mix of flavors and curry pastes, Nasi Padang happens to not only be one of my favorite meals to eat in Singapore, but also possibly one of my favorite meals in the world. At most Nasi Padang restaurant you’ll find a bedazzling display of different curries meats and vegetables, including rendang, a curry of meat in a spice filled dry coconut blend. Zi Char – Zi char is a term in Singapore that refers to cooked food made to order – and it typically refers to any kind of Chinese style stir fried or deep fried dishes. Being half Chinese, I’m a huge lover of Chinese food, so I always enjoy a good zi char meal in Singapore. What I like is that you can typically order off a huge menu and get the exact dish you want, and it’s always served piping hot, right out of the wok or oil, and tastes incredible with rice. 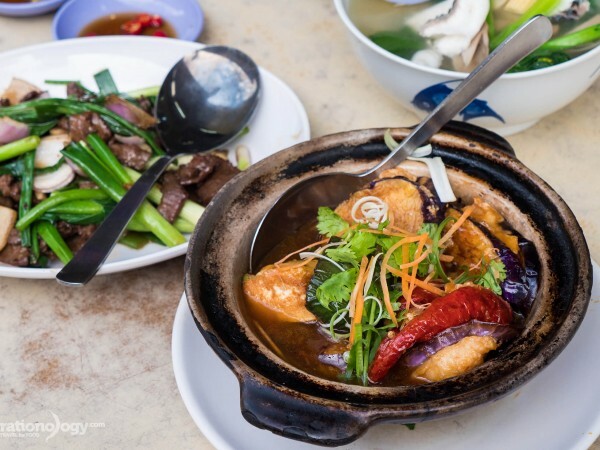 Fish head steamboat – Also known as a fire pot, a steamboat is a circular pan that’s stuffed on the inside with hot charcoal and filled with hot soup in the trough. The soup often comes with fish and a mix of vegetables, though there are some other variations. It’s similar to an old Chinese style hot pot, and part of the fun of eating a steamboat is not just for the food, but for the laid back old style environment, and the steaming hot soup with every bite. 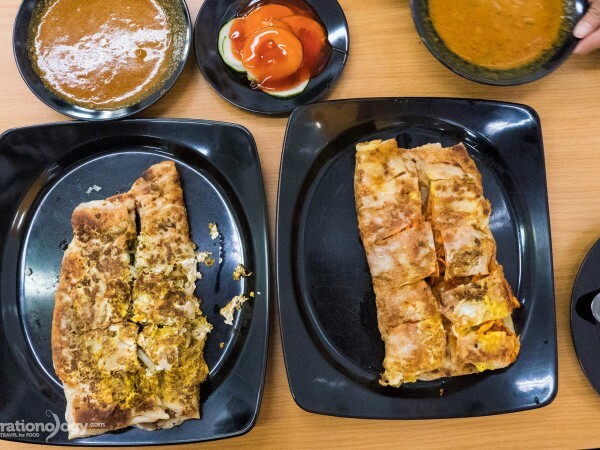 Murtabak – Another favorite food of mine in Singapore is murtabak – a giant thin piece of dough that is filled with a combination of minced meat, onions, and egg, then fried in lots of oil until crispy, and served with curry sauce on the side. Although murtabak (or martabak) is originally an Arab food, in Singapore it’s become more of an Indian local food, and the taste of the strong spices wrapped in crispy dough makes it irresistible. 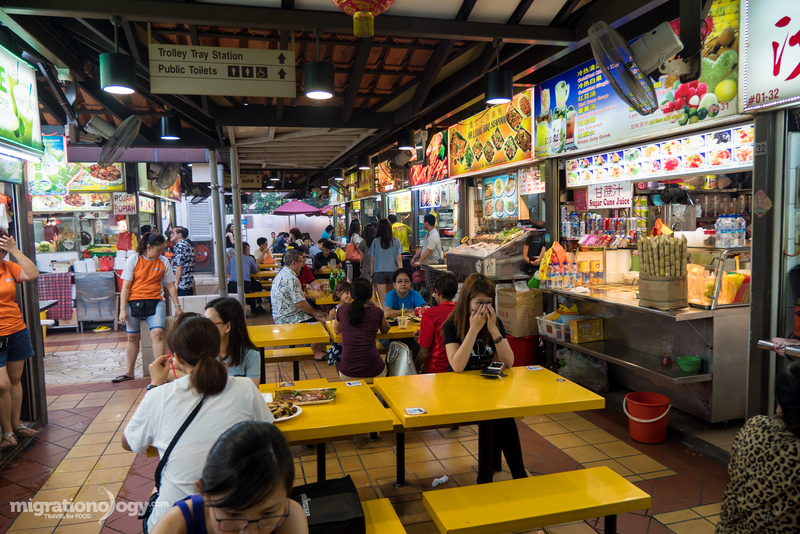 One of the most popular styles of dining in Singapore are food courts, known better as hawker centers, where you’ll find dozens of stalls serving budget, and often some of the tastiest food in the city. Chinatown Complex Food Centre – This is one of the biggest and busiest hawker centers in Singapore, mainly serving all things Chinese food. There’s a very popular place to eat claypot rice at the market. Hong Lim Market Food Centre – This one is another packed out Singapore Chinatown food court with so many food options it will blow your mind. Old Airport Road Hawker Centre – Dr. Leslie Tay conducted a survey for the best hawker centers in Singapore, and Old Airport Road won. It was one of the first in Singapore, it’s big and spacious, and home to some legendary vendors. Tiong Bahru Food Centre – Although one of the oldest Singapore markets and area, this food centre has been newly renovated. It almost has a mall food court appearance, but it’s still open air, very spacious, nice and clean, and plenty of delicious food choices. Geylang Serai Food Centre – For all food Indonesian and Malay, Geylang Serai is one of the best food destinations to visit in Singapore. You’ll find some amazing Nasi Padang stalls in the food court. If you’re like me and love the spices and chilies of Indonesian food, you’ll like this place. Chomp Chomp Food Centre – Although this hawker centre is located a little ways outside of central Singapore, it’s well worth the effort to get here. 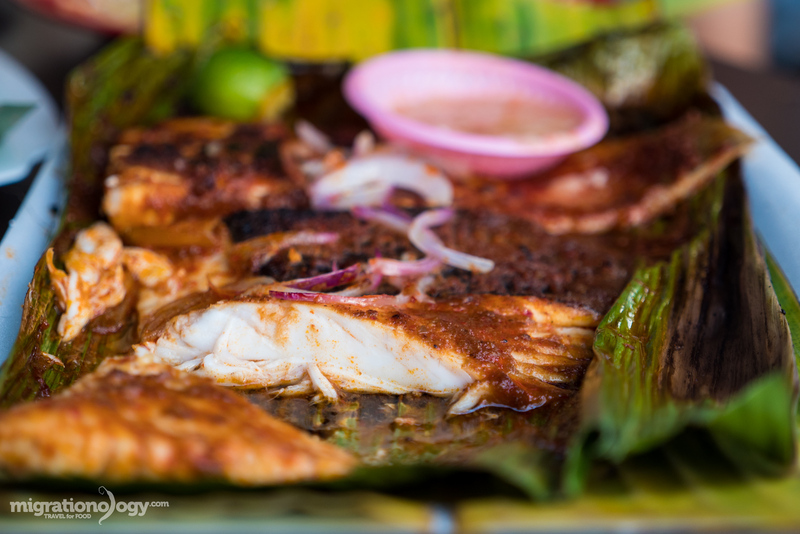 It’s famous for grilled seafood, and it’s one of the best places to get some bbq sambal stingray. I really liked the food centre because it’s small and friendly with a high concentration of delicious food. Here are some of the best places I tried and that I’ve written about. Food is definitely one of the best reasons to visit Singapore. Click here to see all Singapore restaurants. When I was in Singapore, my main goal was to eat, and that’s really what I spent almost all of my time doing. So I just want to clarify that this is not an extensive nor exclusive list of things to do in Singapore, but just a few things that I did while I was there. 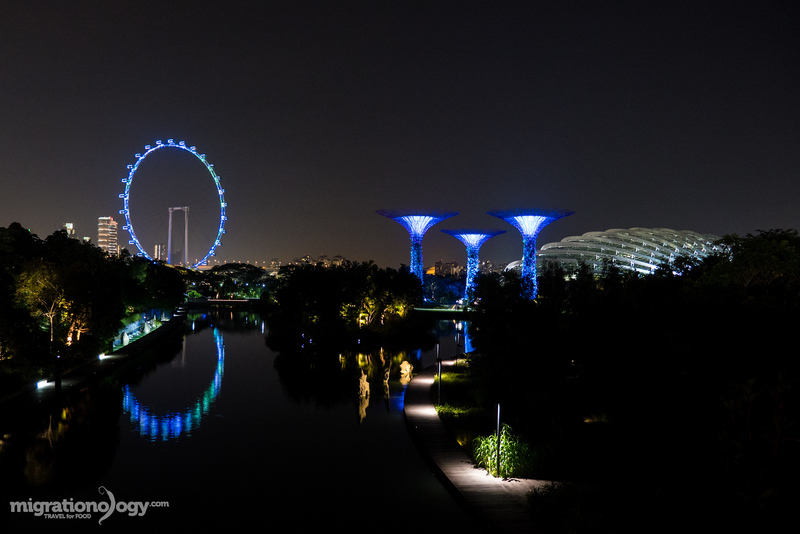 Gardens By The Bay – This beautifully designed nature parks has become one of the most famous icons of Singapore, and it’s a fantastic place to walk around and enjoy the lush greenery of Singapore. The Supertree Grove, giant metal wire tree structure decorated with vines and potted plants, is incredible. Great place for kids in Singapore, and a free attraction as well. Marina Bay Sands SkyPark – Probably the most spectacular hotel in Singapore is Marina Bay Sands, shaped like a boat at the top. If you’re not staying at the hotel, you can pay an entrance fee to go to the top for a full 360 view of Singapore – it’s an impressive view of the Singapore harbor and skyline. Singapore Botanic Gardens – I didn’t really have plans to go to Singapore Botanic Gardens, but after finishing a meal, it happened to be right across the street. The gardens, as with all gardens in Singapore are lush and well taken care of, quite beautiful and well worth a walk around. Chinatown and Little India – What I really love about Singapore is the diversity of the city and how you can be in Chinatown one hour and in Little India the next. 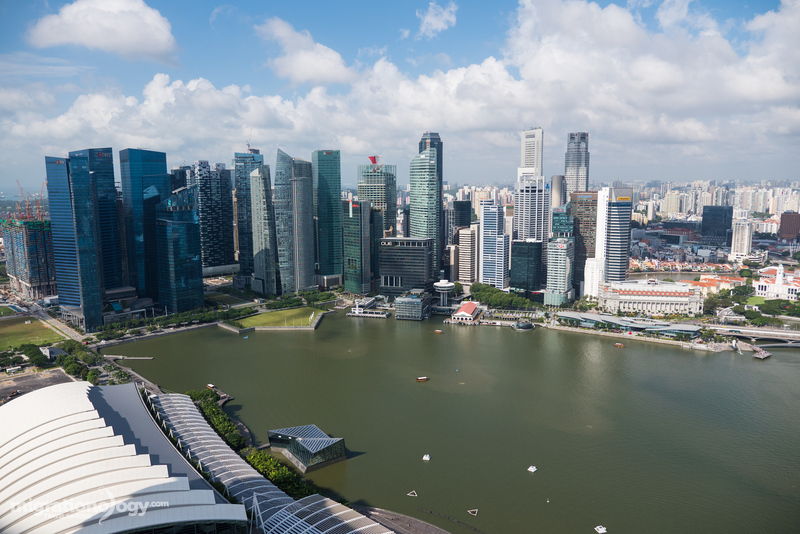 Both areas of Singapore are well worth exploring, and you’ll find lots of food, shopping, entertainment, and interesting cultural things in both areas. In relative terms, Singapore is quite a small city, and overall it’s very easy and hassle free to get from place to place using public transportation. As soon as you arrive at Changi International Airport (that is if you’re flying into Singapore), you can take the MRT directly into the center of the city. At the Airport MRT station you can buy an EZ-Link card, which you can re-fill with money, and it makes transportation much easier. MRT – I took the MRT just about everywhere I went hunting for food in Singapore. The MRT is efficient and works well. The only thing is that stations are sometimes quite far apart, so you may have to walk for 10 – 20 minutes from a station to get to where you want to go. Bus – The public bus system is also really good and it’s pretty easy to figure out some routes. For both MRT and bus you can use your EZ-Link card, and you can add money to it at any MRT station. Public transportation in Singapore is quite affordable. 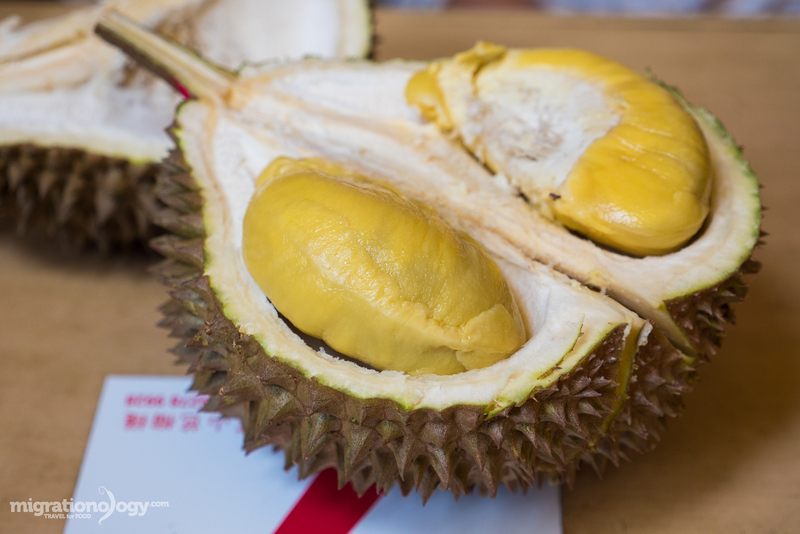 An expensive, but crazy good durian! In comparison to other Southeast Asian major cities, Singapore is a very expensive city especially when it comes to accommodation, attractions, convenience items, and indoor restaurants. However, at the same time, Singapore can be affordable if you take public transportation, eat at local food courts (hawker centers), and take advantage of all the free things Singapore has to do as well. Overall, my wife and I spent an average of $120 SGD per day (for 2 people) while we were in Singapore. We stayed in mid-range hotels, ate mostly hawker food and at local restaurants, and avoided drinks and bars and expensive attractions. Food is one of the best reasons to visit Singapore! Singapore is an amazingly beautiful and well organized city, that offers so much to see and especially so much to eat. It’s a city where you can be eating Indian like biryani or curry and roti food for breakfast, enjoy a meal of Malay rice and curry for lunch, and have an authentic Chinese seafood feast for dinner. 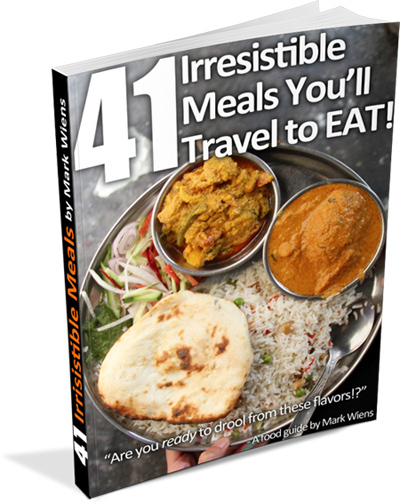 I hope you have an amazing trip to Singapore and that this city food guide gives you some direction for your visit. Whatever you choose to do, make sure you enjoy the delicious food! Do you have any other tips for visiting Singapore? I’d love to hear from you in the comments below.